Thanks to Voice of the Mainland for putting this together (see today's earlier post). I'm not ready to say that LULAC has experienced irreparable harm, but this move by Roger Rocha is beyond the pale. Thanks a million to Austin American-Statesman/Ahora Sí journalist, Liliana Valenzuela, for giving our efforts locally and nationally some ink. Specifically, our national organization met last weekend to discuss accomplishments and steps going forward. Founded in 2000 by Pedro Pedraza and Melissa Rivera, NLERAP's genealogy is connected to civil rights and represents folks nationally in states like California, Chicago, Milwaukee, New York, and Texas. 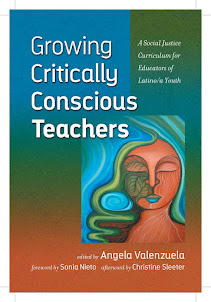 The history of this organization and its key initiative of growing its own educators is covered in my recently-published edited volume, Growing Critically Conscious Teachers (NY: Teachers College Press). It was exciting to have most of the chapter contributors present as follows: Dr. Julio Cammarota, Dr. Jennifer Ayala, Dr. José Cintron, Dr. Adele Arellano, Dr. Margarita Berta-Avila, and Dr. Barbara Flores. It was a real treat, as well, to have Arizona civil rights Attorney Richard Martinez and his wife, Deya Nevarez Martinez, too. Richard was honored with the "Pedraza-Rivera Award for Outstanding Leadership in Latino/a Education." Richard was the lead attorney in the Mexican American Studies precedent-setting lawsuit out of Tucson, Arizona about which I have blogged herein significantly. Thanks again to Dr. Victor Saenz, Chair, Educational Leadership and Policy, and Dr. Leonard Moore, Interim Director, Division of Diversity and Community Engagement for their support, as well as to Herlinda Zamora and Marina Islas of the Mexican American Culture Center, for the space and support to help us make this summit as successful as it was. And thanks to all that volunteered and attending. As evidenced by our own GYO educator site, Academia Cuauhtli, ours is a vibrant, promising agenda to infuse teachers and teacher preparation with the requisite knowledge on how to teach to a Latin@ demographic, and students of color, generally. Among other things, we call for sociopolitical, sociocultural, community-anchored, social justice, participatory action research perspectives and approaches in the preparation of future teachers. A final detail, that Martha Cotera's photo below reminds me of, is the importance of our elders and generational approaches as this grounds, deepens, and guides our sense of purpose. Thanks, Martha, for always being there! Marta Cotera, activista, autora y miembro de la comunidad, estuvo presente en el evento educativo el 27 de enero en el ESB-MACC. LILIANA VALENZUELA / ¡AHORA SÍ! En muchas escuelas del país existe una falta de representación de diversos grupos étnicos entre los maestros. A nivel de pre-kínder, primaria y educación especial, los maestros anglosajones representan el 82.9% de los maestros en Estados Unidos, según un estudio del National Center for Education Statistics del 2011-2012. Y del resto de los maestros, sólo el 7.1% es latino, el 7% afroamericano, 1.9% asiático y 0.4% indígena estadounidense. Para remediar esta falta de representación, un movimiento nacional y local llamado Grow Your Own (cultiva a tus propios maestros) está proponiendo ideas para asegurar que más estudiantes hispanos con conciencia social vayan de la preparatoria a la universidad para después volver a sus comunidades como maestros. Profesores académicos, maestros de escuela, padres de familia, miembros de la comunidad integrado e integrantes de la organización National Latino/a Education Research and Policy (investigación y políticas educativas latinas nacionales, o NLERAP) se reunieron en el Centro Mexicano Americano Emma S. Barrientos (ESB-MACC) el sábado 27 de enero para discutir estrategias y compartir logros. El movimiento trata de concientizar a los estudiantes sobre su cultura y sus valores. “También es un proceso de crítica, de investigar los asuntos que impactan a la comunidad y a ellos, cómo definirlos, analizarlos y qué acción tomar”, dijo la activista y miembro de la comunidad Marta Cotera. Parte de esta estrategia son las escuelas de lenguaje dual, en donde los estudiantes reciben instrucción en su idioma materno y el inglés. Varios maestros asistieron al evento en el ESB-MACC para compartir ideas y sentirse parte de una comunidad más amplia. “Los niños latinos van aumentando su español académico mientras aprenden el inglés. También fomentamos un ambiente en donde su identidad y su cultura son importantes y valoradas”, dijo Luz Álvarez-Sims, maestra de cuarto grado en la primaria Travis Heights. Otra estrategia es la AcademiaCuauhtli, que desde 2014 ha dado instrucción sobre la cultura y la historia mexicoamericana a estudiantes de cuarto grado de unas escuelas de Austin que asisten algunos sábados al ESB-MACC. “Nosotros tenemos que entrenar a nuestras propias maestras y maestros para que sepan cómo concientizar a nuestros hijos de manera que sean pensadores y que tomen acción a favor de sus intereses personales, pero también los intereses de la comunidad”, dijo Cotera. La meta de Grow Your Own es lograr un respeto en el sistema educativo hacia la cultura de los estudiantes y su idioma materno, y eso comienza con tener a suficientes maestros hispanos capacitados. Este movimiento intenta generar un cambio social, crítico y transformativo de la educación. “Tratamos de seguir esa necesidad que tiene nuestra gente de conseguir que las escuelas públicas funcionen bien para ellos y para la próxima generación que viene”, dijo Tony Báez, oriundo de Puerto Rico y presidente de NLERAP, quien también asistió al evento. Check out Roger Rocha's letter to Donald Trump below. This is a terrible, indeed profoundly disgraceful, development involving Roger C. Rocha, Jr., national president of the largest and oldest Latino—predominantly, though not exclusively, Mexican-American—civil rights organization in the U.S., namely, the League of United Latin American Citizens (LULAC). 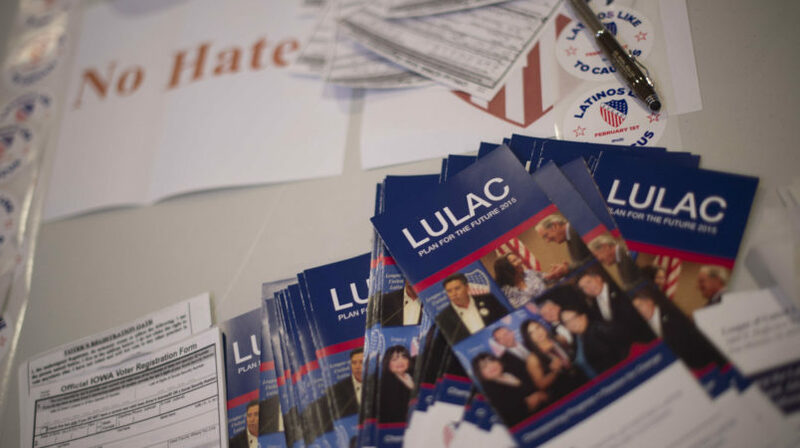 Founded in 1929 in Corpus Christi, Texas, LULAC has approximately 132,000 members throughout the U.S. and Puerto Rico, and has historically advocated for Latinos' civil rights. It boasts over 1,000 LULAC councils nationwide, state-level offices in each state, as well as a national office in Washington, D.C. where Roger Rocha is perched. You can learn more about the history here to sense just how profound a betrayal this is of our history, identity, politics, and ancestors. While the strength of the organization has always been at the local level—which accounts for its endurance over time—this action by Rocha reflects distressingly on us all. Check out the article appearing below. I'm sure there will be others coming out shortly. In expressing support for President Trump's fascist "vision" on immigration in the letter appearing at the bottom of this post, he is aligning himself and, in effect, our organization, to the evil and corrupt politics and agenda of white supremacy. He does not speak for me. He does not speak for us and that is why we are asking folks to sign this online petition to impeach him. I'm hoping for at least 132,000 signatures. Our credibility is at stake. On Tuesday, several Republican congressional leaders touted to reporters that Trump’s immigration proposal had been endorsed by the League of United Latin America Citizens (LULAC)—a Latino civil rights group that for years has advocated for a path to citizenship for young immigrants known as Dreamers. 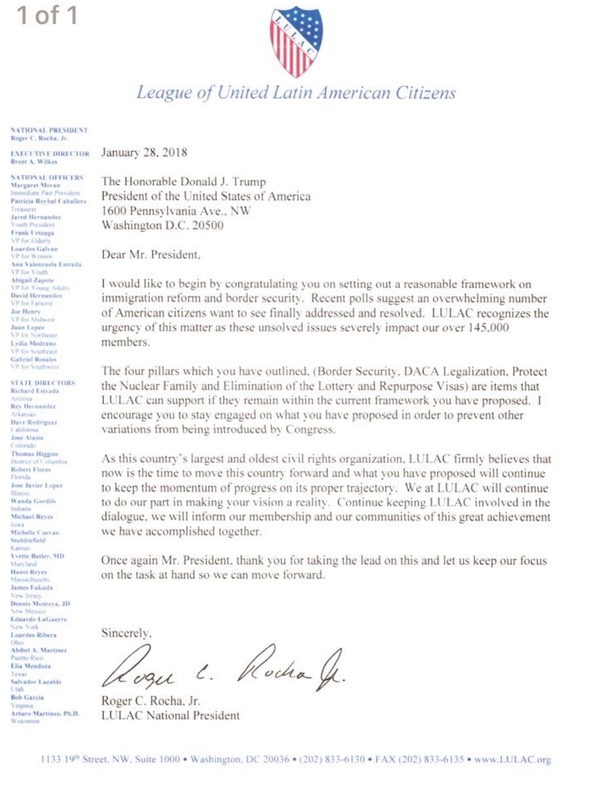 While LULAC’s president Roger Rocha did in fact write a letter to President Trump over the weekend thanking him for “taking the lead” on immigration reform and declaring that the White House framework was one “LULAC can support,” staff at the organization tell TPM that they were completely blindsided by Rocha’s action and were not consulted before the letter was sent. Perez said the organization’s bylaws do allow Rocha to write such a statement on his own without checking first with the group’s other leaders. “Unfortunately, that’s the reality. But it’s not the reflection of the membership,” he stressed. 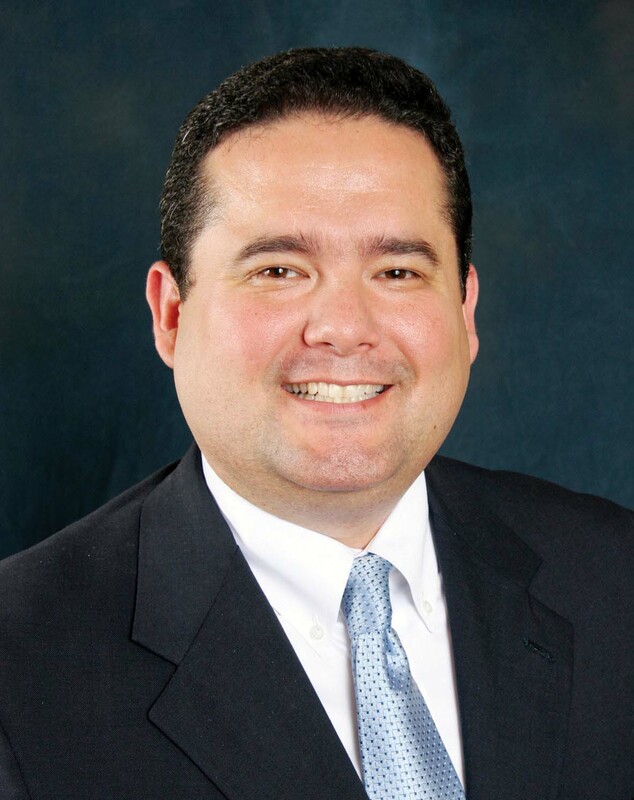 When Senate Republicans cited Rocha’s letter on Tuesday afternoon, however, they characterized it as an endorsement from the organization itself. Rocha did not respond at press time to TPM’s inquiry as to why he wrote the letter and who in the organization he talked to before sending it to President Trump. Signs of a backlash from the group’s membership were apparent on social media Tuesday night. “Moves from the top don’t represent our membership!” wrote Misael Jimenez, the secretary of LULAC’s chapter on the campus of Texas A&M and a member of their national Young Adult Coalition. LULAC’s official Twitter account liked and retweeted several messages from members criticizing Rocha’s letter, including the one below, but later deleted them. A hearing on Mexican American Studies curriculum for secondary public education in the state of Texas is happening today at the Texas State Board of Education meeting at the William B. Travis Building, 1701 North Congress. Feel free to join us, beginning at 1PM. As a member of the K-12 committee of the National Association of Chicana Chicano Studies-Tejas Foco Working Group [@NACCSTejasFoco] referenced below, and as expressed by another member, Dr. Trinidad Gonzales, who penned this op-ed, let's get this matter resolved in a way that honors teachers throughout the state that are already teaching Mexican American Studies. The board can simply vote to have the innovative course curriculum become the official TEKS standard, or have the TEA develop the state standard from the various curricula. The Tejas Foco working group can help provide experts on Mexican-American studies to develop new state standards — if the board chooses the latter option. The first option is the most ideal though, because it is already approved curriculum. Hoping that the board simply votes for having the existing innovative course curriculum get approved. This has been a long hard, indeed historic, struggle for curricular inclusion. Stay tuned. 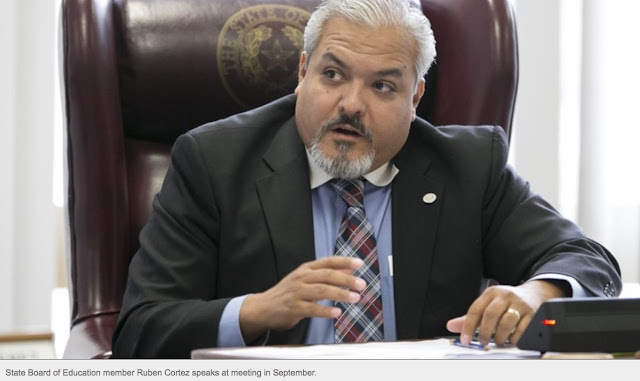 The Board of Education is considering the development of state standards — formally known by educators as Texas Essential Knowledge and Skills — for a Mexican-American studies course Tuesday during its general meeting. The first time this course was proposed was in 2014 — by Ruben Cortez, the board’s District 2 representative. Instead of creating the course, the board sought the submission of textbooks for a possible class as a compromise between supporters and those who were against the idea. Three years later, the issue of creating the course has arisen again — though this time, the debate is whether the State Board of Education will allow the creation of state standards for a widely taught course. During the intervening years, the Texas Education Agency approved an innovative Mexican-American studies course. The innovation course — and Mexican-American history dual-enrollment classes — both have sweeping support across the state. VIEWPOINTS: Will this be the year for a Mexican-American studies curriculum? The National Association of Chicana Chicano Studies-Tejas Foco Working Group has determined that during the last school year, more than 400 students took a Mexican-American studies course across the state. The research is based on data from the TEA and Texas Higher Education Coordinating Board data. Prior to these pathways toward teaching Mexican-American studies, instructors utilized the Social Studies Special Topics course to teach it. The course focuses on research skills, so a wide range of content can be used for instructional purposes. TEA data only indicates how many special topics courses are taught, not what their content is. As a result, courses on Mexican-American studies taught under this category are not included in the working group’s calculation. The Working Group’s estimates is likely an undercount. • The board can simply vote to have the innovative course curriculum become the official TEKS standard, or have the TEA develop the state standard from the various curricula. • The Tejas Foco working group can help provide experts on Mexican-American studies to develop new state standards — if the board chooses the latter option. The first option is the most ideal though, because it is already approved curriculum. There are three reasons for the need of curriculum alignment: First, because of the fragmented nature of the curricula, it is time to establish statewide standards to help bring coherence to a widely taught course. Second, publishers have not sought to create textbooks for the course because of a lack of input to help authors align the text to statewide standards. Third, while many school districts have developed courses on Mexican-American studies, many cannot because they lack the curriculum experts to do so — and because there is a lack of official textbooks that they can use. Establishing the TEKS standard would solve these issues. It is time to recognize that courses on Mexican-American studies exist in Texas — and that the only way forward is for the state board to approve the creation statewide standards. There are no longer any pedagogical or bureaucratic reasons not to do so. Gonzales is a history instructor at South Texas College and a member of the National Association of Chicana Chicano Studies-Tejas Foco Working Group. Excellent report! You can download it here [pdf]. and represent, in my view, grassroots democracy at its best. Let's lend our support to community schools. 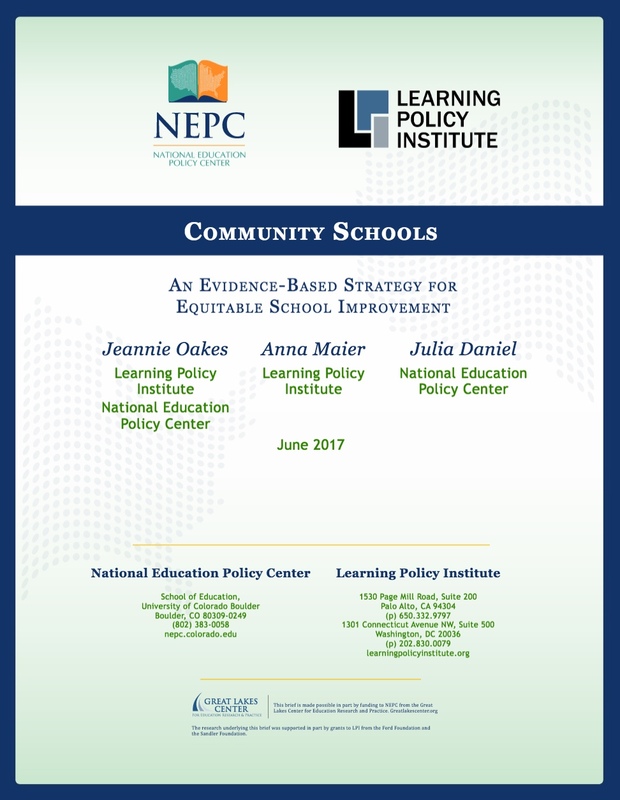 This brief examines the research on community schools, with two primary emphases. First, it explores whether the 2015 federal Every Student Succeeds Act (ESSA) opens the possibility of investing in well-designed community schools to meet the educational needs of low-achieving students in high-poverty schools. And second, it provides support to school, district, and state leaders as they consider, propose, or implement a community school intervention in schools targeted for comprehensive support. The brief is drawn from a larger research review, available at https://learningpolicyinstitute.org/product/comm-schools-equitable-brief. The online research compendium can be found at https://learningpolicyinstitute.org/product/online-research-compendium. 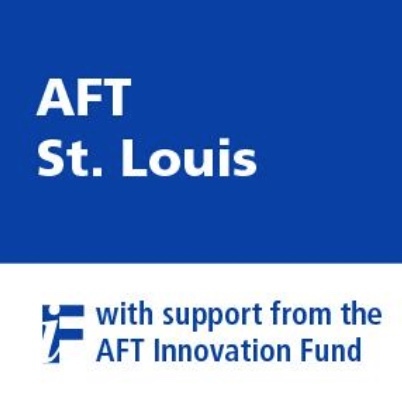 So great to see this step forward in St. Louis that involves a reaccreditation of St. Louis Public Schools, involving the AFT's collaboration with the school district. This is not only a victory for public education, but potentially a model for other places throughout the country. 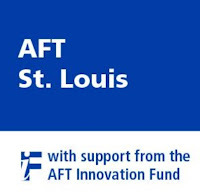 WASHINGTON— AFT St. Louis and its national affiliate, the American Federation of Teachers, have cheered the full reaccreditation of Saint Louis Public Schools, highlighting the collaborative work between the union and the district that set the stage for the decision. At its meeting earlier today, the Missouri State Board of Education approved the district’s reaccreditation, 16 years after it was partially removed. Collaborative work between the local union and the district drove the turnaround after the board stripped power from the elected school board, replacing it with a three-member appointed Special Administrative Board in 2007. The St. Louis Plan, jointly administered by the union and the district, focused on building shared responsibility for teacher-led support for instructional change by strengthening professional learning, as well as many other collaborative steps to drive improvement in the classroom. Richard Gaines, of the SAB, was crAFT St. Louis and its national affiliate, the American Federation of Teachers, have cheered the full reaccreditation of Saint Louis Public Schools, highlighting the collaborative work between the union and the district that set the stage for the decision. The St. Louis Plan, jointly administered by the union and the district, focused on building shared responsibility for teacher-led support for instructional change by strengthening professional learning, as well as many other collaborative steps to drive improvement in the classroom. Richard Gaines, of the SAB, was critical in encouraging cooperation between the district and the union.